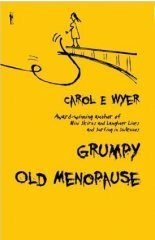 This entry was posted in Announcements and tagged Carol E. Wyer, Grumpy Old Menopause, People's Book Prize by Select Stories. Bookmark the permalink. Thank you for this super post and a huge thank you to everyone who voted for Grumpy Old Menopause. I was overwhelmed by the support I received and I only won thanks to those people. I am still basking in the glory of winning although Mister Grumpy has helped to remind me I am only human. When I asked him where i could put my new trophy he suggested the cooker since I never seem to use it anymore!.